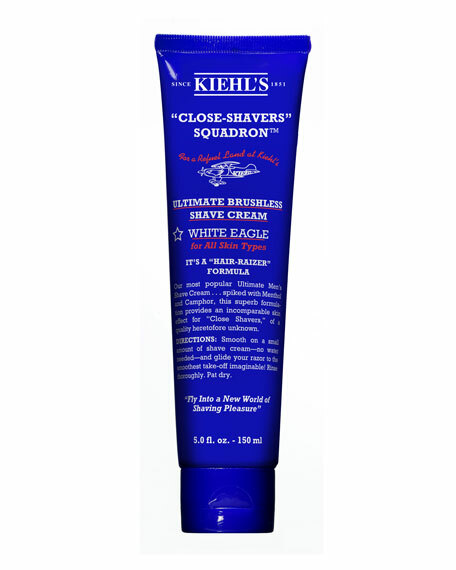 Kiehl's Since 1851 "Close-Shavers" Squadron Ultimate Brushless Shave Cream, White Eagle, 5.0 oz. Kiehl's Since 1851"Close-Shavers" Squadron Ultimate Brushless Shave Cream, White Eagle, 5.0 oz. A rich, moisturizing cream for an incomparably close shave. Leaves skin soft and smooth. For best effect, apply concentrated formulation in a very thin layer to avoid clogging the razor and impeding a close shave. Contains menthol and camphor for the most comfortable, "cool" shaving experience ever.Presented in a 5-ounce jar. For in-store inquiries, use sku #186026.